Lasse Kukkonen "moves the puck well," the Flyers say. The Flyers continued their youth movement last night by acquiring defenseman Lasse Kukkonen in a three-way trade with the Chicago Blackhawks and Detroit Red Wings. The deal sent left winger Kyle Calder to Detroit. Moreover, the Flyers might not be finished dealing before today's 3 p.m trading deadline. The Flyers received Kukkonen, 25, and a third-round pick in the 2007 draft from Chicago for Calder. The Blackhawks then dealt Calder to the Red Wings for center Jason Williams. Calder, who came to the Flyers from Chicago in an off-season trade for Michal Handzus, never lived up to expectations during a frustrating season. He had just nine goals and 12 assists, with a minus-31 rating. Calder was scheduled to be an unrestricted free agent after this season, and is making $2.95 million. Flyers general manager Paul Holmgren said that the team had made a contract offer to Calder, but that it was rejected by his agent, Brad Devine. The Flyers decided that it was best to get value for Calder, and Holmgren said he was impressed by Kukkonen's skills. "Kukkonen is a good skater who moves the puck well - and a good defender," Holmgren said. "He kind of flies under the radar screen, and he is a guy we know because he played with Joni Pitkanen in Finland a few years ago." The 6-foot-1, 190-pound Kukkonen was averaging more than 16 minutes a game for the Blackhawks and had five goals and nine assists in 54 games this season. He was second in blocked shots with 98. Holmgren said he hoped Kukkonen could be at tonight's game against the New York Islanders at the Nassau Coliseum. "We are trying to get him to New York," Holmgren said. "Whether he plays or not, it's a coach's decision." Calder had not given the Flyers what they expected this season. He had played better recently, with eight goals in the last 28 games, after scoring just one in his first 31 contests. 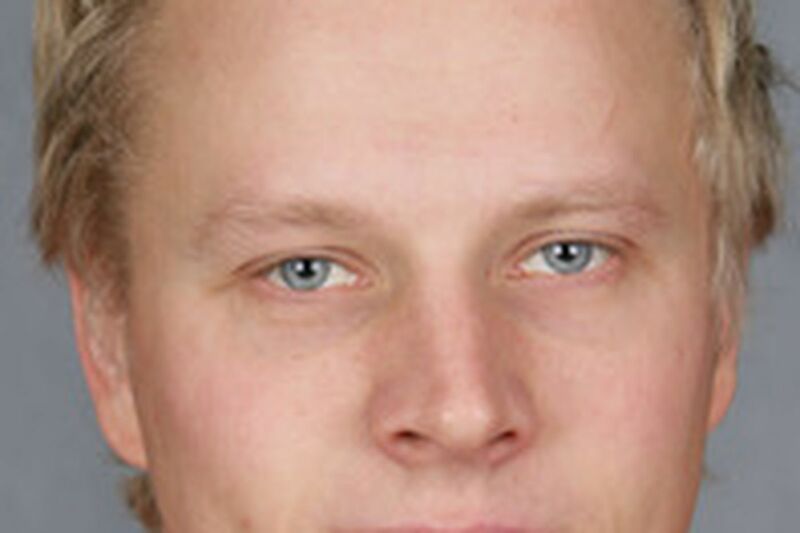 "We feel we got fair value because Chicago's pick will be a fairly high one and we like Kukkonen," Holmgren said. Although Calder's name was in trade rumors, he said he was caught off-guard. "Even though there were rumors out there, any time you are dealt, it is surprising," the 28-year-old winger said. "It's tough because I'm leaving a great organization and hockey town where the fans are unbelievable." But there was some consolation for Calder. "That is what is exciting: going to a team like Detroit that has a chance to go all the way," said Calder, who had 26 goals and 33 assists last season for Chicago. "Now I will do whatever I can to contribute to the Red Wings." Esche on edge. Flyers goalie Robert Esche says the trading deadline cannot come soon enough. Esche's $1 million contract will expire after this season. He has suffered through a season full of injuries and losses. As an unrestricted free agent this summer, Esche could be an attractive pickup for a team looking to make a postseason run. "I would be lying to you if I said I didn't think about it," he said after practice yesterday at the Skate Zone in Voorhees, Camden County. "But that is part of being professional: making sure you come, work hard, and earn your paycheck." The team placed goalie Michael Leighton on waivers yesterday. If he clears waivers by noon today, he can be sent down to the Phantoms. Holmgren said there was a good chance Leighton would clear waivers. Loose pucks. Defenseman Braydon Coburn, acquired Saturday from Atlanta for Alexei Zhitnik, had his first practice with the Flyers yesterday. The 6-foot-5 Coburn was paired in practice with the 6-4 Derian Hatcher. "I just want to try to make an impression and show that I belong here, and show I can play in the NHL," said Coburn, 21, who had four assists in 29 games with Atlanta.